Working in a shop, factory, lab, research facility, warehouse on a construction site or out in the field on a daily basis means that you'll have different types of fuels and chemicals around. There are fuels needed for forklifts, heating, vehicles, generators and other kinds of equipment. It is vitally important to the safe operation of your business to keep fuels stored properly and easily identified. The safe handling of flammables and combustibles requires you provide training and safety rules which include having the proper fuel storage containers on hand. Gasoline, kerosene, diesel and certain combustible oils are the most common fuels used in businesses. To be safe you'll need several different fuel storage container types and sizes in your business. Our fuel storage containers are made of top quality material by Eagle Manufacturing. 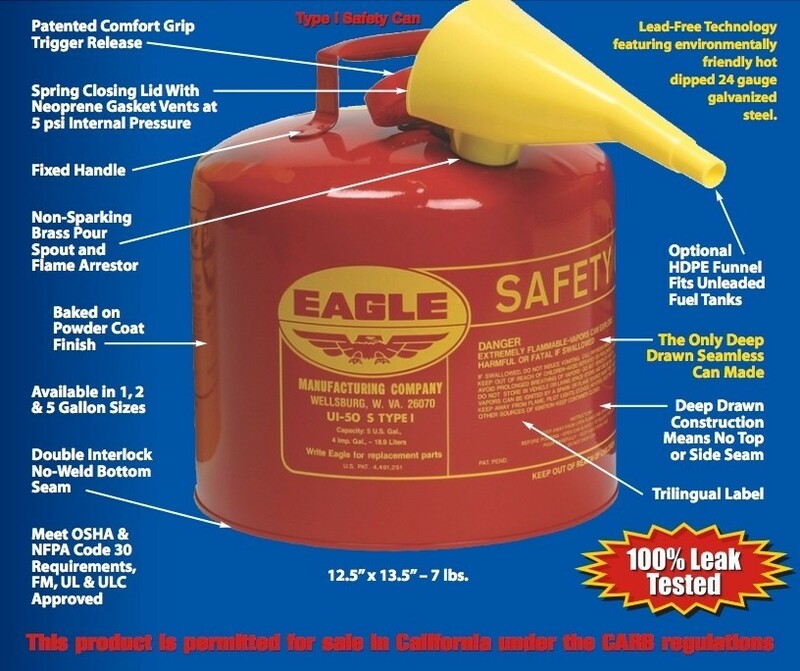 Depending upon the product, the Eagle gas cans are OSHA approved, meet NFPA Code 30 requirements, Ul and ULC listed or FM Approved. See individual products for what standards the Eagle gas cans meet. We carry one of the largest selections of fuel storage containers online. Safety cans for fuels, oils, certain chemicals, for cleaning, for use in labs, for disposal, for on benches as well as some unique speciality cans. Our selection of fuel storage containers are manufactured in various materials such as galvanized steel, poly, stainless steel or coated metal to meet your needs. Our biggest selling fuel storage containers come in two types. The simplest distinguishing feature between the two types are the number of openings. Type 1 fuel storage containers have a single opening used for filling and dispensing the fluids. Type 2 fuel storage containers have two openings. One for dispensing the fuel and one for refilling the fuel storage container. See this graphic for our Type 1 can features. When selecting a fuel storage container, you need to know the difference between flammables and combustibles. The primary difference between a flammable fuel vs. a combustible fuel is the fuel's flashpoint temperature. A flammable or Class 1 liquid has a flashpoint below 100° Fahrenheit (37.8° Celsius). Propane and gasoline as well as isopropyl alchohol are some examples of flammable liquids. Class 2 liquids are the combustibles. Their flashpoint (temperature at which their vapors will ignite) is from 100° to 140° Fahrenheit. Oils, kerosene and grease are examples of class 2 combustible fluids. The BLR website (Business and Legal Resources) has some excellent information on this and a myriad of other safety and business topics. When working around several different types of fuels and other fluids, it is important to keep them contained and stored so that you will always know which chemicals are in which fuel storage container. Color coding helps immensely. You'll find additional information as you look at each of our product lines but, in general: Gasoline is stored in Red containers; Diesel is stored in Yellow containers; Kerosene is stored in Blue cans and Oil combustibles are stored in Green containers. See graphic of color coded cans we have available online. Finally, you'll need to know a couple things about compatibility of your fluid with the material the container is constructed of. Size, on the other hand, depends on the type of work environment or work station. Smaller vessels are ideal for the bench type workstation while a 5 gallon container is better in the field or warehouse where you might be refilling or transferring larger quantities of fluid. Here is a quick reference chart on chemical compatibility of containers. 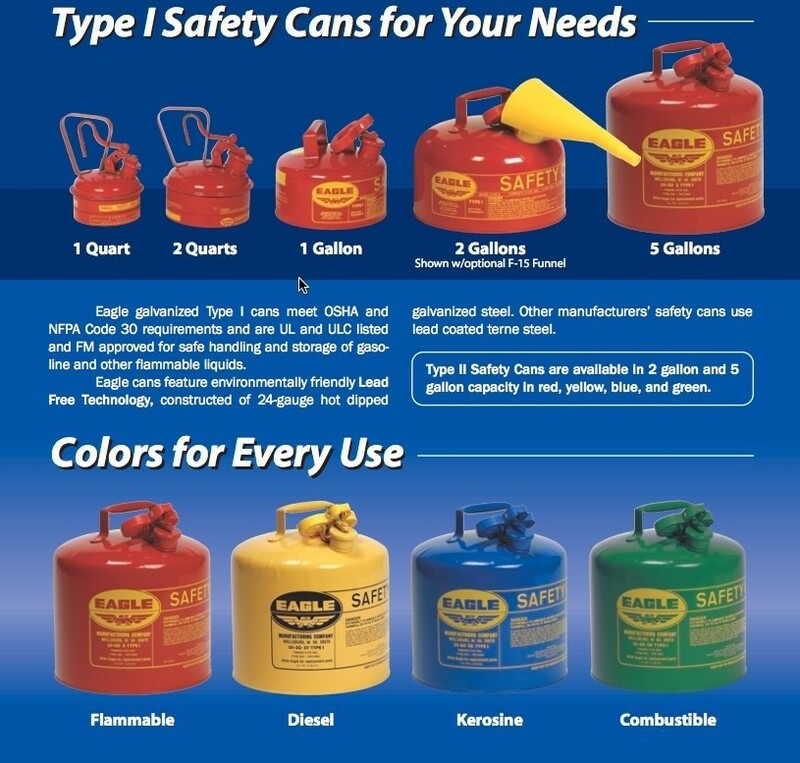 We have a long list of types of safety cans that are available below. Each type has additional information on the product page for that container. If you are have any questions or need additional information please feel free to contact us by email or toll free at (800) 869-9633. 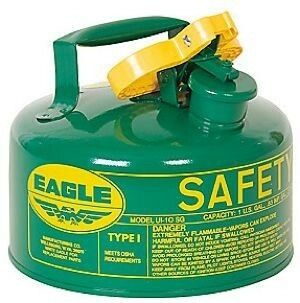 Eagle safety gas cans for the storage of gasoline come in several sizes from 1 quart up to 5 gallons. 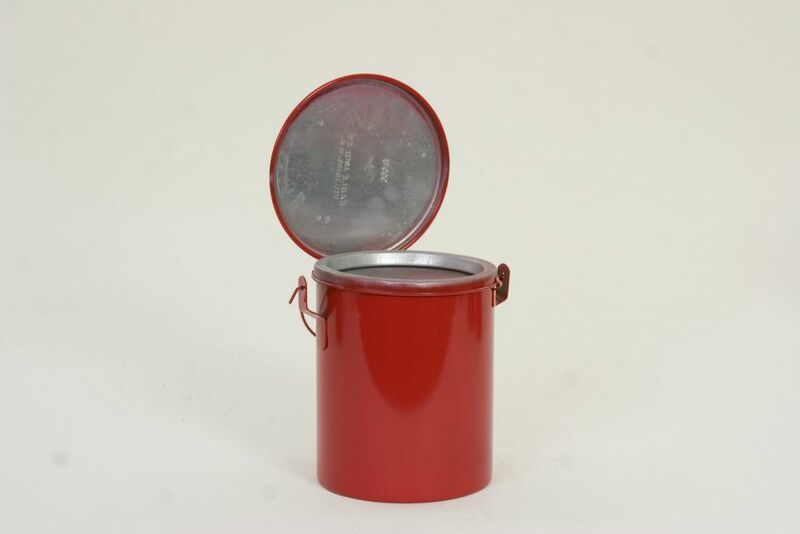 These are Type 1 cans for Class 1 flammables and are in Red. They are available with and without snap on funnels are made of galvanized steel and are made in the USA. They meet OSHA, NFPA and are FM Approved. Eagle diesel fuel containers for the storage of diesel fuel come in several sizes from 1 quart up to 5 gallons. These are Type 1 cans for Class 1 flammables and are color coded Yellow. 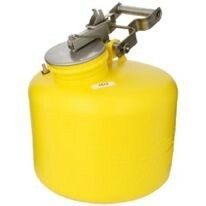 Eagle kerosene fuel containers for the storage of kerosene fuel come in several sizes from 1 quart up to 5 gallons. These are Type 1 cans for Class 1 combustible fuels and is color coded Blue. These galvanized safety cans are painted green to make them stand out for safely storing and dispensing combustible liquids. Available in sizes from 1 quart up to 5 gallons, your sure to find the right size for your shop. Eagle Type II safety containers feature two openings: one for refilling and one for dispensing. Each opening is safety protected with a brass flame arrestor. These are Type 2 cans and are available in red, blue, green and yellow in 2 gallon and 5 gallon sizes. A flexible 10" spout is included. These are made in the USA, meet OSHA, NFPA and are FM Approved. Eagle plastic fuel containers for the storage of flammable liquids come in two sized: 3 gallon and 5 gallon. These are Type 1 cans and are available in white, red and yellow. An optional snap on funnel is available. These are made in the USA and they meet OSHA, NFPA and are FM Approved. Eagle Laboratory Containers come in 2 materials: Stainless Steel (2 colors; Stainless and Red) and HPDE Polyethylene (3 colors: Red, White and Yellow). Operate your lab safely and in compliance with OSHA regulations by utilizing these Type 1 safety cans. Our 1/2 Gal and 1 Gal cans feature a self closing spring loaded lid to reduce or eliminate vapors and risk of accidental spillage. Transporting fuel to and from the job site or location where it is needed requires a different type of container. Riding around in a vehicle subject the gas can to more potential to get damaged or for spills and accidents to take place. You need a gas safety can with extra protection to keep it closed and with protection from damage. Our Type 2 DOT Approved gas Cans come in Red for Gasoline and Yellow for Diesel Fuel. See detailed information on our product page. For parts cleaning and other work with solvent, a plunger can is handy way to stay safe. When you need a little more solvent on your rag or parts cleaning sponge, just press down on the plunger can and the can will dispense just what your need. Working with fluids, both new unused and used fluids, you need containers. Faucet cans make great containers for dispensing a variety of fresh fluids from gasoline to oils and kerosene. Auto mechanics safe a lot of time and cleanup efforts when oil changes can be contained quickly and easily without splashing. Our lift oil drain cans are perfect for that. For small, portable containers of fresh oil, see our tallow cans. For the bench, you need small capacity safety cans and parts cleaning cans. From ½ pint up to 8 quarts and safety colored in red, our bench cans and daub cans will keep your workstation safe and organized. USA made with strong galvanized steel and designed for years of use containing your flammable solvents, these safety cans come in a variety of sizes with several options for lids and parts cleaning baskets. For all the used solvents, oils and other liquid waste, you'll need safety liquid waste containers. These are Type 1 Safety Cans and are available in sizes from 2½ gallon up to 5 gallon sizes. We offer a complete set of colors to choose from. White, Yellow, Red or Stainless Steel so you can keep your different waste types separated and color coded for safety. Constructed of 316 stainless steel in 24 gauge with electrically welded seams, these type 1 safety cans are available in 3 sizes. 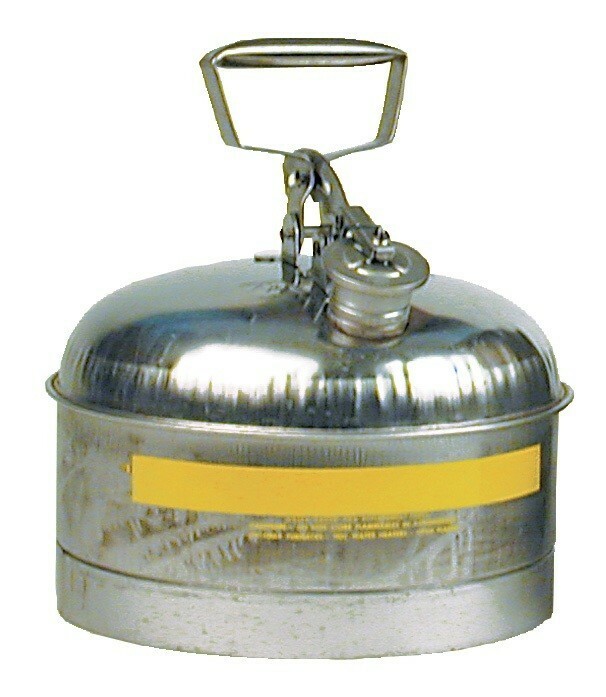 Use with most alcohols, ethers and hydrocarbons, these cans feature stainless spark arrestors and spring loaded lids.